There exist surging societal needs for materials and products made from renewable and sustainable resources that are biodegradable, carbon neutral and non-petroleum based. Cellulose is the most abundant biopolymer on earth and has long been used as the sustainable building block for paper, foods and construction materials. Wood fibers are the main natural source of cellulose and have an intrinsically hierarchical structure (Fig. 1A). Such a hierarchical structure of cellulose fibers and the associated unique molecular feature (Fig. 1B) hold promises to enable an array of highly desirable properties and thus could enable unconventional applications beyond their traditional uses. In this month’s iMechanica Journal Club, we would like to focus on recent progress on unconventional applications of cellulose, and hope to initiate further discussions on this research frontier. More comprehensive reviews of cellulose can be found in Ref. (1-4). Figure 1. (A) Hierarchical structure of wood fibers and the characteristic of cellulose fibrils. Note the rich inter-chain hydrogen bonds among neighboring cellulose molecular chains. (B) Atomic structure of a cellulose chain repeat unit. Note the six hydroxyl groups (red circles) in each repeat unit. A 20~50 µm thick native wood fiber comprises thousands of nanofibrillated cellulose (NFC) fibers (5-50 nm in diameter), each of which can be disintegrated into finer elementary fibrils consisting of cellulose molecular chains (1-10). Cellulose molecule is a linear chain of ringed glucose molecules, with a repeat unit (Fig. 1B) comprising two anhydroglucose rings (C6H10O5) linked through C-O-C covalent bond. Rich hydroxyl groups in cellulose molecule (six in each repeat unit) enable facile formation of hydrogen bonds, both intra-chain and inter-chain (Fig. 1A). 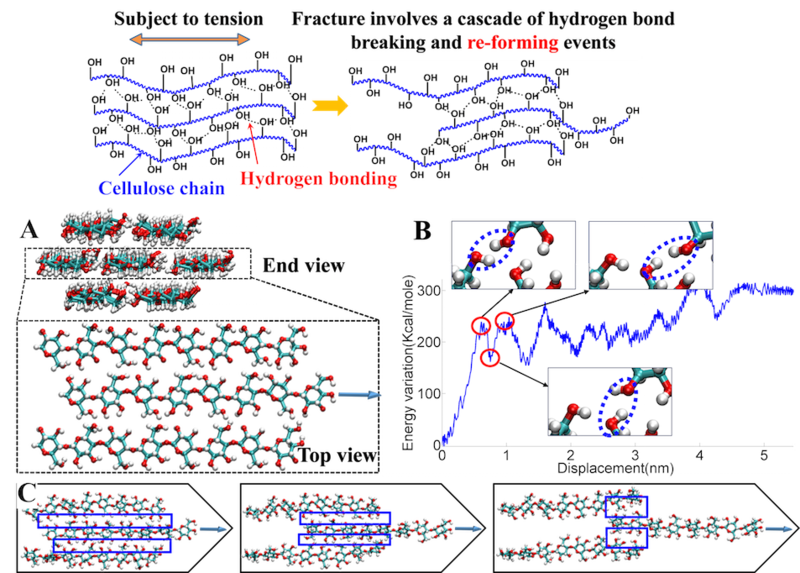 While the intra-chain hydrogen bonding stabilizes the linkage and results in the linear configuration of the cellulose chain, inter-chain hydrogen bonding among neighboring cellulose molecules plays a pivotal role in the deformation and failure behaviors of cellulose-based materials. Cellulose has appealing mechanical properties, with specific modulus (~100 GPa/(g/cm3)) and specific strength (~4 GPa/(g/cm3)) higher than most metals and composites, and many ceramics, making it as a promising building block for functional and structural materials (Fig. 2). Fig. 2. Ashby plot of specific modulus vs. specific strength. Cellulose is superior over many engineering materials. The quest for both strength and toughness is perpetual in advanced material design; unfortunately, these two mechanical properties are generally mutually exclusive. So far, there exists only rather limited success in attaining both strength and toughness, which often involve material-specific, complicated (e.g., introducing high density nanotwins) or expensive (e.g., bulk metallic glass with dendrite) synthesis processes and thus are hardly applicable to other materials. A general mechanism to address the conflict between strength and toughness still remains elusive. To gain insight toward a generally applicable solution to the challenge of attaining both strength and toughness, we have devised and conducted a study on the mechanical properties of cellulose-fiber-based paper, with constituent building block size ranging from 10s μm down to 10 nm. Surprisingly, we find that both the strength and toughness of cellulose nanopaper increase simultaneously (40 and 130 times, respectively) as the size of the constituent cellulose fibers decreases (from a mean diameter of 27 μm to 11 nm), revealing an anomalous but highly desirable scaling law of the mechanical properties of cellulose nanopaper: the smaller, the stronger and the tougher. Figure 3. An anomalous scaling law of strength and toughness of cellulose nanopaper: The smaller, the stronger AND the tougher. Figure 3A shows the schematic of cellulose nanopaper, made of a random network of NFC fibers. Inset shows the high resolution transmission electron microscope image of a ~11 nm NFC fiber. Figure 3B shows the stress-strain curves of tensile tests of cellulose paper made of cellulose fibers of various mean diameters. 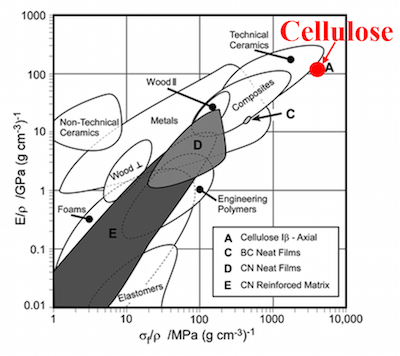 As the cellulose fiber diameter decreases from μm scale to nm scale, both tensile strength and ductility of the cellulose paper increases significantly, leading to an anomalous scaling law shown in Figure 3C: The smaller, the stronger AND the tougher. Figure 3D further reveals that the ultimate tensile strength scales inversely with the square root of cellulose fiber diameter (11). Figure 3E shows optical (inset) and scanning electron microscope image of a CNT film made of network of CNT bundles. Figure 3F shows that, lack of inter-CNT hydrogen bonds, the CNT film has a much lower tensile strength and toughness than the cellulose nanopaper, although the constituent CNT bundles and NFC fibers have comparable diameter (11nm). Figure 4. Molecular-level toughening mechanism of cellulose nanopaper. Figure 4 shows that failure of cellulose nanopaper involves a cascade of hydrogen bond forming, breaking and re-forming events, which dissipate a significant amount of energy, thus lead to much enhanced fracture toughness of cellulose nanopaper. Figure 4A shows the simulation model of a cellulose bundle contains seven cellulose molecular chains. Top view only shows the middle three chains for visual clarity. Figure 4B shows the variation of total potential energy as a function of the sliding displacement of the center cellulose chain out of the bundle. Insets clearly show the hydrogen bond breaking and re-forming events (dotted circles), each of which dissipates energy. Figure 4C illustrates relative cellulose chain sliding, during which a series of hydrogen bond breaking and re-forming events happen when neighboring hydroxyl groups come close to each other. The boxed region shows the evolution of newly formed hydrogen bonding region during pulling-out process (only middle three chains are shown for visual clarity). The atomistic scale toughening mechanism envisioned and proved above is in line with recent studies on the interfacial energy between cellulose nanocrystals(12, 13). Figure 5. Molecular dynamics simulation of the fiber-scale deformation process in cellulose nanopaper and CNT films. Figure 5A shows the simulation models of the two surface areas in direct contact for parallel sliding between two NFC fibers (top panel) and that between two CNT bundles (bottom panel). Figure 5C shows the variation of total potential energy as a function of relative displacement of parallel sliding between two NFC fibers (green) and that between two CNT bundles (blue). The contribution from hydrogen bonds between NFC fibers (red) is included for comparison. Figure 5E shows the evolution of resistant force during parallel sliding of two neighboring NFC fibers (red) and two neighboring CNT bundles (blue). Figure 5B, 5D and 5F show the results for the case of perpendicular sliding, in correspondence to A., C. and E., respectively. The variation of total hydrogen bonding energy, which matches well with that of the total potential energy in terms of both peak location and amplitude, offering strong evidence for the cascade of events of hydrogen bond breaking and re-forming during the sliding process and the dominant role of hydrogen bonding in the toughening mechanism of cellulose nanopaper. The magnitude of resistant force in NFC fiber case is substantially higher than that in the CNT case, shedding light on molecular scale understanding of the huge difference in tensile strength between cellulose nanopaper and CNT films. The findings from this shed fundamental insight on the long-sought strategy addressing the conflict of strength versus toughness in engineering material design by envisioning a bottom-up design strategy to achieve both high strength and toughness that is generally applicable for a wide range of other material building blocks. The opportunities are abundant and multi-faceted. There exist a wide variety of other biodegradable cellulose fibers and man-made fibers, with rich features in morphology, length, topology, crystallinity, and surface groups that can be further leveraged to enable both strong and tough cellulose based materials under the same bottom-up design strategy (40-45). The fundamental bottom-up strategy can essentially go beyond one-dimensional (1D) building blocks (tubes, wires, filaments) toward two-dimensional (2D) building blocks (e.g., atomic layers of graphene oxide (GO), boron nitride and molybdenum disulfide) and 1D/2D hybrids. In the next subsection, we present a recent exploration toward these fertile opportunites. We design and investigate microsized fibers by hybridizing GO and NFC (14). Great synergistic interactions between GO and NFC are identified, which led to noticeable improvements in the mechanical properties of these microfibers compared to microfibers made solely from one of the two building blocks. Well-aligned, strong microfibers were successfully fabricated by wet spinning a liquid crystal solution consisting of 2D GO nanosheets with 1D NFC. Figure 6 shows the structure of the GO-NFC hybrid microfibers produced in this study. In the hybrid microfiber, the GO nanosheets and NFC chains align along the direction of the microfiber. Figure 6. (a) Schematic of a GO-NFC hybrid microfiber consisting of aligned GO nanosheets and NFC chains along the microfiber direction. The synergistic interaction between NFC and GO leads to greatly improved mechanical strength, elastic modulus and toughness. (b-d) Optical and SEM images of GO-NFC hybrid microfibers. (e-g) SEM images of the cross-section of a GO-NDC hybrid microfiber. Figure 7. Typical stress-strain curves of tensile tests of GO microfibers, NFC microfibers, and GO-NFC hybrid microfibers before (a) and after (b) metal ion infiltration. Figure 7A exhibits the typical stress-strain curves for tensile tests of GO microfibers, NFC microfibers, and GO-NFC hybrid microfibers. To improve the mechanical properties of our GO-NFC hybrid microfibers, we utilize metal ions (Ca2+) to introduce ionic bonding between the GO and the NFC by taking advantage of the oxygen and carboxylate groups from these two building blocks. We infiltrate the hybrid microfibers in a CaCl2 water solution in order to further improve the strength of the fibers. Figure 7B depicts the typical stress-strain curves for tensile tests of GO microfibers, NFC microfibers, and GO-NFC hybrid microfibers after metal ion infiltration. The synergistic effect of improving the mechanical properties of fibers is clearly demonstrated. The major finding of this study lies in that the well-aligned hybrid microfibers are much stronger and tougher than the microfibers composed of 1D NFC or 2D GO alone. Further molecular dynamics simulations revealed that the synergetic interaction between the GO and NFC is the key to the enhanced mechanical performance since the introduction of NFC provides extra bonding options between the GO nanosheets similar to the way larger GO nanosheets can bridge neighboring NFC chains, enhancing both the tensile strength and toughness of the microfibers. The synergistic interaction between 1D NFC and 2D GO revealed in this study is also applicable to other material building blocks facilitating a new design strategy to create a wide range of mechanically strong microfibers. Solar cell substrates not only require high optical transparency but also prefer high optical haze to increase the light scattering and consequently the absorption in the active materials. Unfortunately, there is always a trade-off between these two optical properties, which is exemplified by common transparent paper substrates exhibiting a transparency of about 90% yet a low optical haze (<20%). In this work, we introduce a novel transparent paper made of wood fibers that displays both ultrahigh optical transparency (∼96%) and ultrahigh haze (∼60%), thus delivering an optimal substrate design for solar cell devices (9). 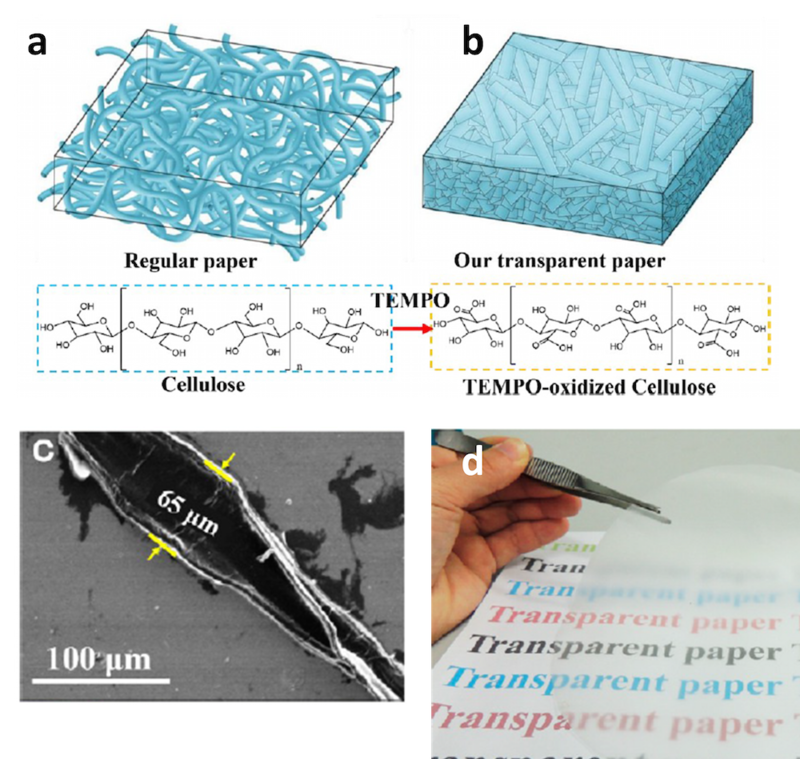 Compared with previously demonstrated nanopaper composed of wood-based cellulose nanofibers, our transparent paper has better dual performance in transmittance and haze but also is fabricated at a much lower cost. This high-performance, low-cost transparent paper is a potentially revolutionary material that may influence a new generation of environmentally friendly printed electronics. Figure 8. (a) Top left, regular paper; bottom left, molecular structure of cellulose. (b) Top right, transparent paper made of TEMPO-oxidized wood fibers; bottom right, TEMPO-oxidized cellulose with carboxyl groups in the C6 position. SEM images of unzipped TEMPO-oxidized wood fibers (c). (d) A digital image of transparent paper produced from TEMPO-oxidized wood fibers. For efficient and low-cost production of transparent paper with high transmission haze, in this study the 2,2,6,6-tetramethylpiperidine-1-oxyl (TEMPO) /NaBr/ NaClO system was used to modify the surface properties of the pristine wood fibers by selectively oxidizing the C6 hydroxyl groups of glucose (left bottom in Figure 7a) into carboxyl groups under aqueous conditions (right bottom in Figure 7b). The repulsive force resulting from additional higher negative charges at the surface of the nanofibers loosens the interfibrillar hydrogen bonds between the cellulose nanofibers resulting in the fiber cell walls are significantly open and crush. Regular paper is a porous structure composed of untreated wood fibers with a tubular structure; however, paper made from TEMPO-oxidized wood fibers displays a more densely packed configuration (top left Figure 8b). Compared to the original fibers, the TEMPO-oxidized fibers swell such that the width of the fibers expanded while the length decreased. Most fibers are cleaved and unzipped in the axial direction. Figure 9. Optical properties of our transparent paper, nanopaper, and PET. Transmission haze is an important optical property for optoelectronic devices and refers to the percentage of light diffusely scattered through a transparent surface from the total light transmitted. For the transparent paper in this work, a transmission haze over 50% is demonstrated while maintaining a transmittance of over 90%. Higher transmission haze improves the light absorption efficiency of solar cells from the increased path of light transmitted into the active layer, resulting in an enhanced short circuit current density. The wavelength versus transmission haze is plotted in Figure 9b. It is critical to combine the optical haze and transmittance for substrates toward different applications. The performance of optical transmittance versus wavelength of substrates has been widely investigated but the optical haze is largely ignored. As shown in Figure 9d, a high clarity for substrates is crucial for displays. Glass and plastic substrates all meet this requirement. Recently developed nanopaper has an optical haze of 15− 20%, which is too high for display applications, but it is more suitable for solar cells. Note some outdoor displays also requires substrates with a high haze to avoid glare under sunlight. All these substrates have an optical transmittance of ∼90%. Our transparent paper has an optical transmittance of ∼96% and transmittance haze of ∼60%, which is the most suitable substrate for solar cells. On a separate note, the transparent paper made of unzipped cellulose nanoribbons (Fig. 8b) is shown to be both stronger and tougher than regular paper made of original hollow cellulose fibers (9). This feature is well explained by the strengthening and toughnening mechanisms revealed in Section 3.1, given that the unzipped cellulose nanoribbons significantly enhance the formation of hydrogen bonds in between these nanoribbons due to its planar nature, in contrast with the point or line contacts in between hollow cellulose fibers. Advanced energy storage technology is a crucial component in integrating renewable energy sources, whose success holds promise to revolutionize facets of our daily life through high performance batteries for personal devices and electric cars. Development of next-generation high performance batteries relies on the new choice of electrode materials and structures. Wood naturally absorbs ions and water as part of the metabolism process. Specifically, this function is performed by wood fibers. The wood fibers are intrinsically soft, porous, and form into a multichannel structure. We demonstrate tin film anodes coated on a natural wood nanofiber can successfully accommodate the huge volume change during charging/discharging cycling by wrinkling and enable fast ion transport, offering a potential solution to sodium-ion batteries for low-cost and green grid-scale energy storage (8). The hierarchical structure of wood fibers, spanning the macroscale to the nanoscale, is illustrated in Figure 1a. Wood fibers are tracheids, hollow elongated cells that transport water and mineral salts. One tracheid is comprised of thousands of microfibrils cellulose, creating a multichannel, mesoporous structure ideal for the absorption and transport of water and essential ions. Natural wood fibers with diameters on the order of 25 μm serve as the substrate for our Sn film. Compared to conventional rigid metallic substrates, the wood fiber is extremely soft. We hypothesize that the soft substrate acts as a mechanical buffer during the sodiation/desodiation process. Figure 10a-b illustrates how the wood fibers release the stresses experienced by the Sn electrode. The substrate deforms together with the Sn film and wrinkles to release high stresses and prevent the delamination and pulverization characteristic of Sn anodes. SEM observation confirms our hypothesis. Figure 10c shows that the electrodeposited Sn initially forms a continuous film on the conductive wood fiber. The formation of a wrinkled structure on all wood fibers is observed in Figure 10d. The wrinkling is associated with fiber deformation, resulting in the improved cycling performance. Figure 10e plots the specific capacity versus cycle number for Sn on three different substrates at a rate of C/10; natural wood fiber, Cu, and ALD Al2O3-coated wood fiber. The Sn-coated wood fiber remains an initial discharge capacity of 145mAh/g after 400 cycles; among the best cycling performance for Sn anodes in Na-ion batteries. Figure 10. (a-b) Soft wood fiber substrates effectively release sodiation-generated stresses by structural wrinkling. Morphology of Sn-coated wood fiber before (c) and after (d) 400 charging and discharging cycles. (e) Electrochemical performance of the Sn anodes. To understand the effect of wood fiber on the dramatic increase in electrochemical performance, continuum chemomechanical modeling is performed to investigate the surface morphology evolution of the Sn-coated wood fiber during galvanostatic charging and discharging. The modeling results clearly confirm that the wood fibers act as a mechanical buffer. As the system is charged, Na ions insert into the Sn and induce compressive stresses in the film. Given the large aspect ratio of the Sn film and large Sn/ wood fiber stiffness ratio, the initially smooth morphology of the thin Sn film becomes unstable and wrinkles when the compressive film stress is sufficiently high. Figure 11a plots the Sn film morphology on the wood fiber and the contour of hoop stress σθθ (normal stress in the circumferential direction) in the Sn film at the fully sodiated and half sodiated states, respectively. Figure 11b plots the hoop stress distribution through the fully sodiated Sn film thickness at three representative locations: the crest (A), midpoint (B), and trough (C) of the wrinkle. For comparison, the hoop stress distribution in a fully sodiated Sn film supported by a stiff substrate is plotted in Figure 11b. The majority of sodiation-induced hoop stresses in the wrinkled Sn on wood fiber are significantly less than those in the smooth Sn film on a stiff substrate. Modeling results further reveal that wrinkling of the Sn film on a soft cellulose fiber during sodiation half-cycle not only mitigates the sodiation-induced compressive stress but also plays a crucial role in reducing the tensile stress level in the Sn film during the desodiation half-cycle. It is this tensile stress that is the key driving force for Sn anode fracture during cycling. During discharging, Na ions are removed from the Sn film, smoothing out the wrinkling deformation. The Sn film recovers the rather smooth initial morphology after complete desodiation. Desodiation causes contraction of the Sn film; contraction that is constrained by the substrate. As a result, tensile hoop stresses accumulate in the Sn film during discharging. A high hoop stress could initiate and drive crack propagation through the Sn film, leading to the mechanical failure of the anode and capacity loss. In discharging the wrinkled Sn film from the fully sodiated state, smoothing of the wrinkled morphology partially accommodates the film contraction. Consequently, the resulting tensile stress after discharging is reduced. Stiff substrates (Al2O3 or Cu) also constrain the discharging-induced contraction in the Sn film. As shown in Figure 10c,d, the majority of tensile stresses of the Sn film supported by the wood fiber at full desodiation are effectively reduced. In comparison, high tensile stresses are apparent throughout the Sn film supported by a stiff substrate. In some locations on the Sn film supported by the wood fiber (e.g., near the interface at A or near surface at C), the tensile stress is moderately higher than for the stiff substrate-supported Sn film. The stresses are localized to an area half the thickness of the entire Sn film; the stresses in the other half of the film, however, are much less. This behavior is crucial to prevent crack propagation through the film. Cracks initiating from regions of high tensile stresses will not propagate through the entire Sn film due to an insufficient driving force in the low stress region. The overall structural integrity of the Sn film is preserved, ideal for high cycle performance. By contrast, the high tensile stresses in the Sn film supported by a stiff substrate are uniform through the entire film. Once cracks initiate, they will propagate through the film, pulverizing the Sn anode and reducing the active capacity and cycle performance. Figure 11. 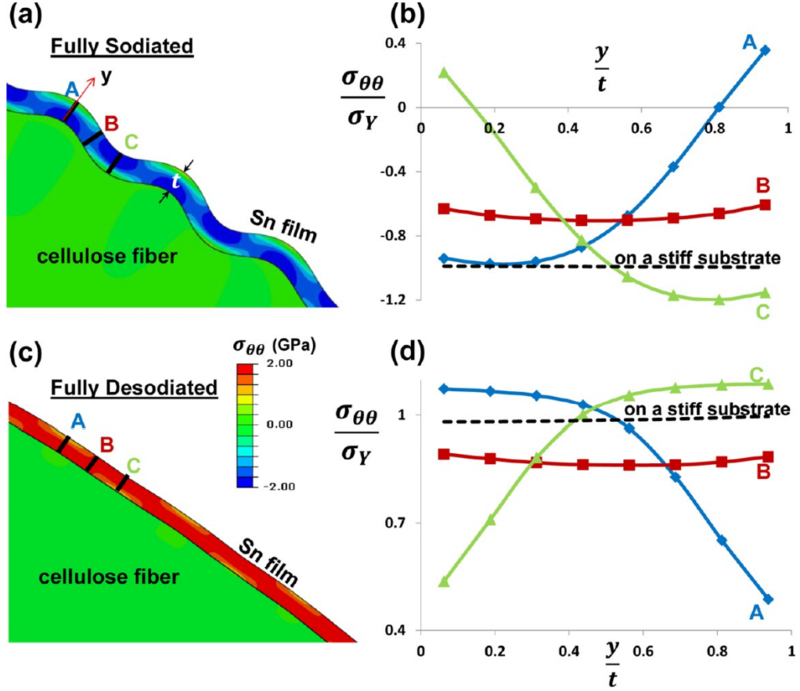 Chemomechanical modeling of the hoop stresses in a Sn anode film on a cellulose fiber at the fully sodiated (a-b) and desodiated states (c-d). Cellulose fibers with porous structure and electrolyte absorption properties are considered to be a good potential substrate for the deposition of energy material for energy storage devices. Unlike traditional substrates, such as gold or stainless steel, paper prepared from cellulose fibers in this study not only functions as a substrate with large surface area but also acts as an interior electrolyte reservoir, where electrolyte can be absorbed much in the cellulose fibers and is ready to diffuse into an energy storage material (15). The value of this internal electrolyte reservoir is demonstrated by comparing a series of hierarchical hybrid supercapacitor electrodes based on homemade cellulose paper or polyester textile integrated with carbon nanotubes (CNTs) by simple solution dip and electrodeposited with MnO2. Atomic layer deposition of Al2O3 onto the fiber surface was used to limit electrolyte absorption into the fibers for comparison. Configurations designed with different numbers of ion diffusion pathways were compared to show that cellulose fibers in paper can act as a good interior electrolyte reservoir and provide an effective pathway for ion transport facilitation. 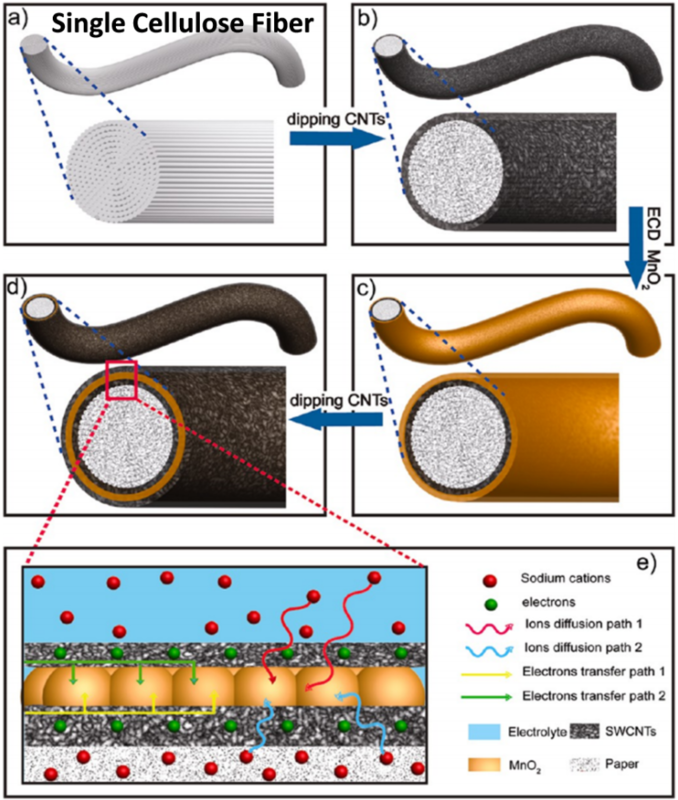 Further optimization using an additional CNT coating resulted in an electrode of paper/CNTs/MnO2/CNTs, which has dual ion diffusion and electron transfer pathways and demonstrated superior supercapacitive performance. The merits of the mesoporous cellulose fibers as substrates for supercapacitor electrodes are highlighted, in which the water-swelling effect of the cellulose fibers can absorb electrolyte, and the mesoporous internal structure of the fibers can provide channels for ions to diffuse to the electrochemical energy storage materials. Figure 12. Schematic illustration for synthesis process of an electrode of paper/CNTs/MnO2/CNTs. (a-d)Multiple coatings are performed on the cellulose fiber. (e) Magnification of the square area highlighted in (d) to illustrate the dual electron charge transfer and ion diffusion paths in the paper/CNTs/MnO2/CNTs (P-CMC) configuration. Figure 13. Schematic to show how NFC disperses 2D materials. C, O, and H atoms are represented as gray, red, and white spheres, respectively. Red negative circles denote negative charges. In this study (16), TEMPO-oxidized NFC is used as a dispersant to disperse 2D materials (BN and MoS2) in water. Figure 13 illustrates the mechanism for the dispersion of 2D materials by NFC: NFC attaches to the flakes through the interaction between its hydrophobic sites and the flake's hydrophobic plane as well as hydrogen bonding between the NFC hydroxyl groups and the defective edges of the 2D materials. The flakes are stabilized due to steric hindrance and the electrostatic repulsive forces generated by the charged NFC carboxyl groups. This method is more suitable for green, large-scale dispersion of 2D materials since proper disposal of the solvent is not an issue any more. As shown in Fig. 14, coating the filter with a layer of NFC hydrogel, through a dipping and drying process, takes advantage of hydrogel’s hydrophilic behavior. This behavior causes the filter to absorb water until reaching saturation when it creates a hydration layer. 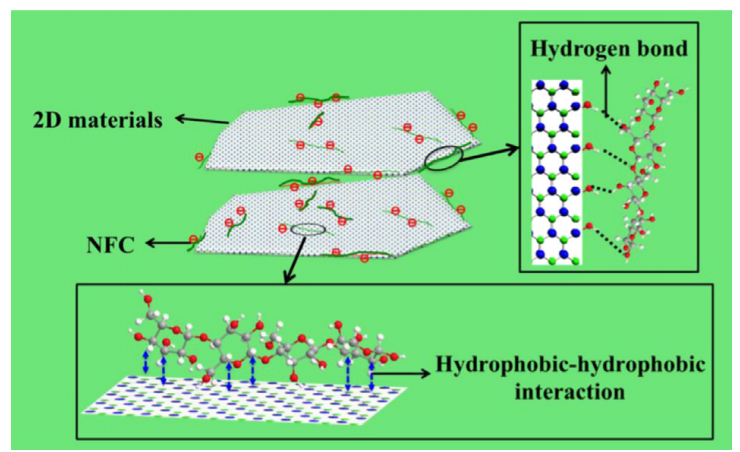 The triple interface layers of hydrogel, water, and oil enhance the oleophobic behavior. The roughness of the hydrogel traps water in the microscopic crevices. The big difference in surface energy between oil and water keeps oil from penetrating the filter. Without the coating, both oil and water are capable of penetrating through the filter. Hydrating this coating generates oleophobic behaviour, while retaining hydrophilicity without using traditional functionalization groups. The hydrophilic/oleophobic behavior is uniquely created by taking advantage of the different properties and structures of cellulose at both the macroscopic and nanoscopic scale without introducing any harmful chemicals (17). Figure 14. Schematic of water oil separation using a hydrated filter. Water passes through, while oil is retained above. The filter is a regular cellulose paper with a layer of coated cellulose hydrogel. D. Klemm et al., Nanocelluloses: A New Family of Nature-Based Materials. Angewandte Chemie-International Edition 50, 5438-5466 (2011). D. Klemm, B. Heublein, H. Fink, A. Bohn, Cellulose: Fascinating biopolymer and sustainable raw material. Angewandte Chemie-International Edition 44, 3358-3393 (2005). H. Khalil, A. Bhat, A. Yusra, Green composites from sustainable cellulose nanofibrils: A review. Carbohydrate Polymers 87, 963-979 (2012). G. Chinga-Carrasco, Cellulose fibres, nanofibrils and microfibrils: The morphological sequence of MFC components from a plant physiology and fibre technology point of view. Nanoscale Research Letters 6, (2011). N. Lavoine, I. Desloges, A. Dufresne, J. Bras, Microfibrillated cellulose - Its barrier properties and applications in cellulosic materials: A review. Carbohydrate Polymers 90, 735-764 (2012). A. Isogai, T. Saito, H. Fukuzumi, TEMPO-oxidized cellulose nanofibers. Nanoscale 3, 71-85 (2011). 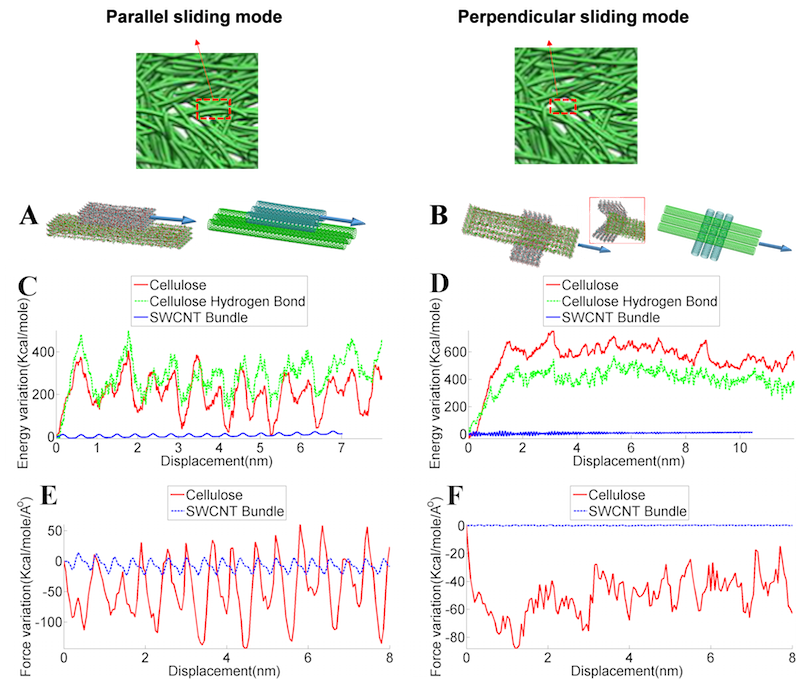 M. Samir, F. Alloin, A. Dufresne, Review of recent research into cellulosic whiskers, their properties and their application in nanocomposite field. Biomacromolecules 6, 612-626 (2005). 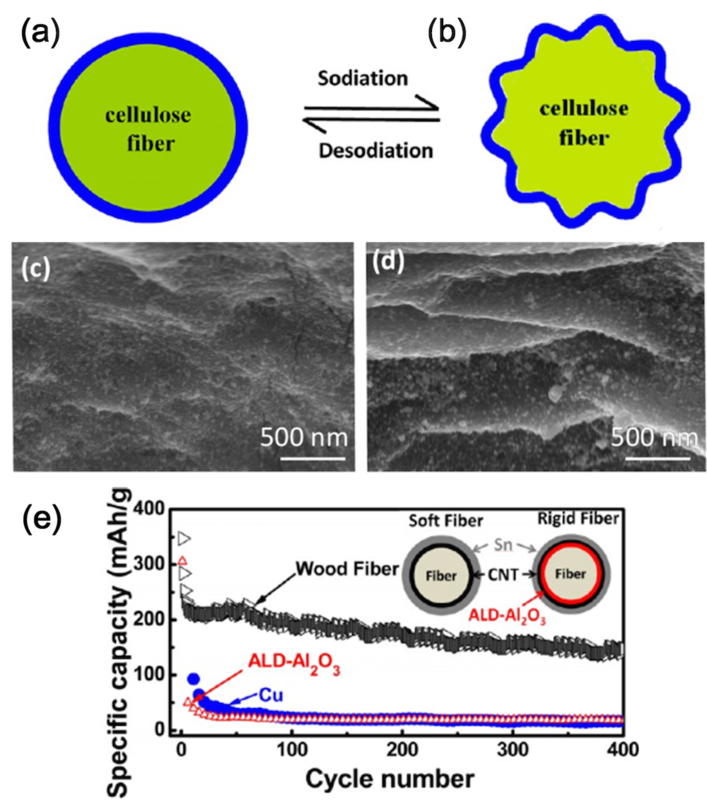 H. Zhu et al., Tin Anode for Sodium-Ion Batteries Using Natural Wood Fiber as a Mechanical Buffer and Electrolyte Reservoir. Nano Letters 13, 3093-3100 (2013). Z. Fang et al., Novel Nanostructured Paper with Ultrahigh Transparency and Ultrahigh Haze for Solar Cells. Nano Letters 14, 765-773 (2014). R. Moon, A. Martini, J. Nairn, J. Simonsen, J. Youngblood, Cellulose nanomaterials review: structure, properties and nanocomposites. Chemical Society Reviews 40, 3941-3994 (2011). 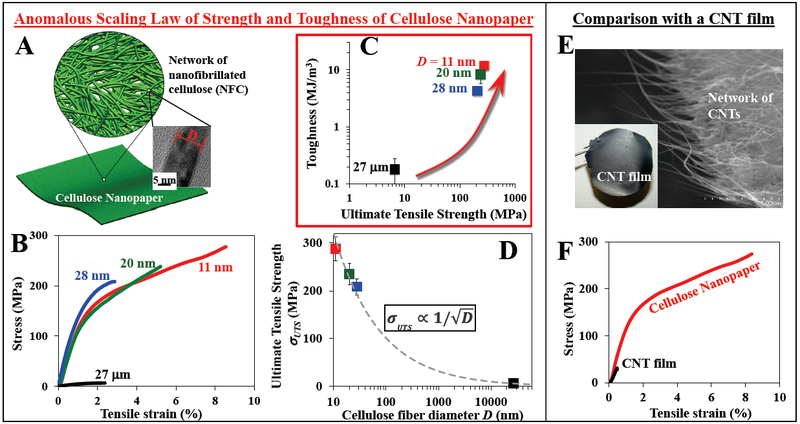 H. Zhu et al., Anomalous scaling law of strength and toughness of cellulose nanopaper. Proceedings of the National Academy of Sciences, (2015). X. Wu, R. Moon, A. Martini, Atomistic Simulation of Frictional Sliding Between Cellulose I beta Nanocrystals. Tribology Letters 52, 395-405 (2013). R. Sinko, S. Keten, Traction-separation laws and stick-slip shear phenomenon of interfaces between cellulose nanocrystals. Journal of the Mechanics and Physics of Solids 78, 526-539 (2015). Y. Li et al., Hybridizing wood cellulose and graphene oxide toward high-performance fibers. Npg Asia Materials 7, (2015). 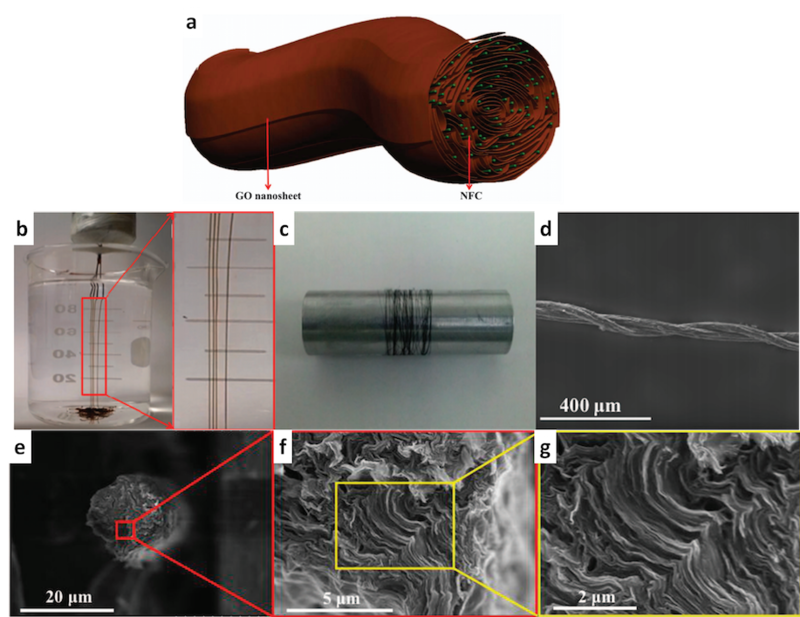 Z. Gui et al., Natural Cellulose Fiber as Substrate for Supercapacitor. Acs Nano 7, 6037-6046 (2013). Y. Li et al., Nanocellulose as green dispersant for two-dimensional energy materials. Nano Energy 13, 346-354 (2015). K. Rohrbach et al., A cellulose based hydrophilic, oleophobic hydrated filter for water/oil separation. Chemical Communications 50, 13296-13299 (2014). Permalink Submitted by ahmedettaf on Tue, 2015-11-03 08:41. 1. Since the nano cellulose paper is transparent it may have a potential application in structure health monitoring. If we imagine wrapping a structural component with this paper and the component experiences additional strain, the cellulose paper will deform (may wrinkle for example) and its interaction with light may change leading to change in color. Thus the color may be indicative of the state of strain in the substrate. One can further study the changes in refractive index of the nanocellulose paper as a function of strain and use this as a guide for structural health evaluation using optical methods. 2. A more classical use would be to implement cellulose fibers as reinforcement in structural elements. While the stiffness and yield strength are lower than steel, they have reasonable values for structural applications beside being more robust and not susceptible to corrosion. Indeed, fiber reinforced polymers FRP have witnessed a surge of use in strengthening and repair work of RC structures in recent years. Permalink Submitted by Teng Li on Tue, 2015-11-03 10:31. Nanocellulose paper is distinct from transparent plastic foils. Nanocellulose paper is made of a network of cellulose nanofibers that can be readily functionalized or coated with other materials. This gives a wide range of flexibility to fine tune the structure of the nanocellulose paper to achieve desirable properties. For example, certain areas of a nanocellulose paper can be potentially made elelctrically conductive, making possible to seamlessly embed electronic circuits in such a paper. By contrast, a plastic foil is often made of densely packed molecular chains. While it is possible to functionalize the constituent molecular chains, it often involves rather complicate processing procedures given its molecular-level size. Certain nanocellulose paper can be made to be of both high transparency and high haze, a pair of typically compromising properties. Such a unique combination of optical properties is desirable for solar cells, as detailed in Section 4.1. If the function of harvesting solar energy can be achieved in nanocellulose paper based structural health monitoring (SHM) components, it could poentially address the typical challenge of power supply in SHM systems, given the long service term and dispersed distribution of such systems. I also find your idea of studing the changes in refractive index of the nanocellulose paper as a function of strain and use this as a guide for structural health evaluation inspiring. This is an aspect we haven't considered yet and I'm not aware of research progress on this. On a separate but relevant note, there have been progress on correlating deformation/damage with color change of materials (see below for an example), demonstrating the potential of using simple optical method for structural health monitoring. Permalink Submitted by ahmedettaf on Tue, 2015-11-03 15:06. I am glad you found some of these ideas of common interest and relevance. Indeed, the motivation is, as you mentioned, the unique properties these nanocellulose films rae exhibiting. In particular, the fact that the films could be made electroconductive might provide another tool for SHM through exploring how conductivity (or electric current flow) changes as a function of strain or through the evolution of damage. I am also quite intrigued by your proposal of combining SHM with energy harvesting. Thanks for sharing the paper on correlating damage with color. In that paper chemistry plays the main role. It may be possible through the use of transparent films (like the nanocellulose one) to have a similar effect through light-material interaction and changing color due to modulating light diffraction by surface deformation. Permalink Submitted by Shuze Zhu on Tue, 2015-11-03 12:32. Thanks for pointing out to use cellulose fibers as reinforcement in structural elements. This review article, Composites reinforced with cellulose based fibres, Prog. Polym. Sci. 24 (1999) 221–274, (http://www.sciencedirect.com/science/article/pii/S0079670098000185) is a very classical review paper discussing reinforcement effect. More recently, here is a report on making self-healing materials using cellulose and cationic poly (Bio-Inspired Multiproperty Materials: Strong, Self-Healing, and Transparent Artificial Wood Nanostructures, ACS Nano, 2015, 9 (2), pp 1127–1136, http://pubs.acs.org/doi/abs/10.1021/nn504334u). Hope this is of your interests. Permalink Submitted by ahmedettaf on Tue, 2015-11-03 15:13. Thank you very much for your reply and providing these very interesting references. Indeed, as early as ancient Egypt and China :) people have been using fibers (from wood and hay and other materials) to reinforce clay and mud bricks and stone and to overcome some negative thermal effects (e.g. shrinkage cracking). So thank you for pointing to that review paper on this aspect. I will read it with much interest. I am also personally interested in self-healing biological and bio-inspired materials and I find the toughening mechanism for the nanocellulose paper through multiple hydrogen bonding intriguing. We have modeled a similar phenomena in bone but in that case it was ionic bonding. I will share this work below. Permalink Submitted by Zheng Jia on Tue, 2015-11-03 12:53. 1) Investigate the mechanical response of nano-sized cellulose fibers by micro-scale simulation. Mechanical behaviors including but not limited to yielding strength, hysteresis, rate-dependence need to be extracted from micro-scale simulations. Then the mechanical properties obtained can be implemented into FEM to reveal the macro-scale response of the composite. 2) Understanding the adhesion between cellulose fibers (made of NFC fibers) and matrix materials such as thermoplastics are also critical to design better cellulose-reinforced composites. The influence of increasing density of hydrogen bonds on the adhesion needs to be revealed. Moreover, as commented by Teng, cellulose nano-fibers can be readily functionalized by other materials, which implies that the adhesion between cellulose fibers and matrix materials might be tuned by adding functional groups. The effectiveness of the methods needs to be evaluated carefully by experiments and simulations. Just my 2cents. Permalink Submitted by ahmedettaf on Tue, 2015-11-03 15:19. These are very fundamental questions and are very relevant to a variety of application whether using the fiber as a reinforcement or the nanocellulose film as an attachment to other surfaces. I am very much looking forward to seeing what the case for the nanocellulose fiber will tun out to be as this is a very interesting application. Ofcourse an integration of experiment and multiscale simulations is required to address these fundamental issues. Permalink Submitted by ahmedettaf on Tue, 2015-11-03 15:25. Also related to a couple of points you raised related to rate depedence as well as the density of hydrogen bonding, we have been doing some theoretical investigations on rate dependent response of non-collagenous proteins with sacrificial ionic bonds in bone. These materials show rate strengthening as well as time-depednent self-healing. I wonder if some of these techniques are relevant to nanocellulose films. http://journals.aps.org/pre/abstract/10.1103/PhysRevE.88.012703. In the case of sacrificial bonds, it does not seem that the more there are the better, in fact the gain in toughness saturates after a certain density of sacrificial bonds: http://journals.plos.org/plosone/article?id=10.1371/journal.pone.0056118. I wonder if a similar effect will be noticed for the hydrogen bonding. Permalink Submitted by Shuze Zhu on Fri, 2015-11-06 01:46. It's very interesting to read your papers about sacrificial bonds. For the rate effect, we would like to point out that, like all atomistic simulations, the effective loading rate (~100 m/s) is orders of magnitude higher than the real loading rate in the experiments (5 mm/min), due to the limit of computation cost. Nonetheless, our atomistic simulations show that, even at such a much higher loading rate, the hydrogen bond breaking and reformation can readily occur among neighboring cellulose fibers. It may be because of that hydrogen bond density per surface that is available to dissipate energy in cellulose nanopaper is rather always fixed and maximized (due to the crytal structure of cellulose chain, and such a feature might be different from that of sacrifical bonds?). When this density is high, the hydrogen bonding is so prevalent in every direction ( thinking of a compact entangled fiber network ) that it is hard to ignore certain bonds even if the loading rate is high. On the other hand, there is room for improvement in the hydrogen bond density per volume that is available to dissipate energy by further and further decreasing feature size, but we don't have data to this end, as capped by our smallest available fiber diameter. Indeed it is intriguing to see if further increase in the hydrogen bond density per volume would result in saturating the gain in toughness. Permalink Submitted by Xiaodong Li on Tue, 2015-11-03 22:10. Teng, this is a great topic. Indeed we need to revisit natural materials. Bamboo is another example. Below is the paper I published years about on bamboo. Permalink Submitted by Teng Li on Thu, 2015-11-05 09:41. Xiaodong, thanks for bringing up this aspect (BTW, once again I'm amazed and wonder if there is any materials you HAVEN't studied, :) ). We should have cited your 2009 paper, and will do so in future related publications. It's interesting to see that the nanoscale building blocks of bamboo show the feature of cobble-like polygonal nanograins. I wonder if you looked into the aspect ratio of such cellulose nanograins. If the findings in our study work for bamboo, one would expect longer cellulose nanograins (or nanofibers) would lead to more energy dissicpation under deformation, thus can lead to a higher toughness. This is an aspect that deserves further investigation. Thanks. Permalink Submitted by keten on Tue, 2015-11-10 19:11. Thank you so much for a very nice overview of recent works on nanocellulose. It is very exciting to see the applications of the nanofibrils to paper systems where strength and toughness tradeoffs can be seen. Have you thought about studying cellulose nanopaper at different relative humidities? I was curious how moisture uptake influences the mechanical properties in relation to regular paper for example, including creep behavior. Also, what about surface functionalization with polymers or other chemical groups? Do you think other toughening mechanisms could be activated in such systems given that nanocellulose is amenable to these surface modifications? Permalink Submitted by Teng Li on Wed, 2015-11-11 22:57. Thanks for your interests in this topic. We studied your recent work on interfacial mechanics of cellullose nanocrystals with great interest. Creep behavior of paper is of key importance to paper and packaging industry. Take the corrugated paper box as an example. When such boxes are stuffed with goods and then stacked on top of each other for storage over a long time, the sides of the boxes will bulge, and may eventually lead to the collapse of the stack. Such bulging deformation is a consequence of the creep of paper. Creep behaviors of paper are similar to that of many polymers, and strongly tied to the molecular feature of the consitituent fibers and the nature of the chemical process used in making paper. The environmental effects, such as temperature and moisture, can lead to the so-called "accelerated creep" in paper products, and have been systematically studied by paper industry over the years. Given the molecular nature as shown in Fig. 1, cellulose paper (regular or nanopaper) falls into the category of hydrogen bond dominated solids, whose mechanical properties are controlled primarily by the hydrogen bond density in such solids. For example, the Young's modulus of a hydrogen bond dominated solid is shown to be proportional to the hydrogen bond density (# of hydrogen bonds per unit volume) to the power of 1/3 [Nature (1955)]. Therefore, it is expected that the stiffness of paper decreases as the hydrogen bond density decreases. It has been shown that water molecules can cause hydrogen bond dissociation in such solids in a cooperative manner [Nature (1976)]: one bond breaking and triggering other bonds to break cooperatively, similar to the formation and breaking of hydrogen bonds in water. Above said, the creep behavior of cellulose nanopaper, especially under the influence of moisture, remains as an open question so far, and awaits further investigation in light of existing insights from the studies of conventional paper. Hope this is helpful. Permalink Submitted by Shuze Zhu on Thu, 2015-11-12 12:25. Regarding to surface functionalization, I would like to point out a prospect that the CNT films could be strengthened and toughened by adding surface functionalization. It is experimentally feasible to introduce functional groups on CNT surface, for example as illustrated in a recently paper (Nano Research, 8, 2242-2250). The carboxyl groups are functionalized on the sidewalls of carbon nanotubes. We expect that, by further adding of cellulose into these functionalized CNT systems, a strong and tough hybrid CNT/cellulose film could be potentially achieved, in comparison with the pure CNT films which often suffer from poor mechanical properties despite of the superior strength of individual CNTs. This is on-going research and we hope to be able to report with more details in near future. Thanks. Permalink Submitted by Zheng Jia on Thu, 2015-11-12 15:09. Thanks so much for your interests in this topic. In papermaking industry, surface chemical modification has long been used to strengthen paper by altering the nature of physicochemical interactions between cellulose fibers. The adhesion between fibers can be improved through chemical modification by increasing the enthalpy of interactions. One example along this line is the synthesis of ionic cellulose derivatives such as carboxymethyl cellulose. Hysteresis caused by unzipping and rezipping the network of ionic bonds in carboxymethyl cellulose intrinsically introduces new toughening mechanism to the system. Here I would like to point out one nice review paper "Unconventional methods in cellulose functionalization, Progress in Polymer Sciences, (2001)". I believe these experimental exercises from chemistry and materials science will pump new idea and momentum into our mechanics community.